A promising first half fizzles badly in the second half. The 'Burb is half of a good film, succeeding in painting a typically eccentric picture of life in the suburbs before disintegrating into a muddled mass murder mess. 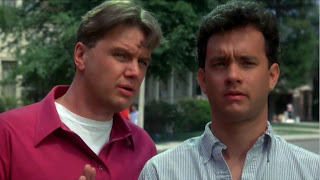 In a seemingly quiet suburb, Ray Peterson (Tom Hanks) is on vacation. Much to the disgust of his wife Carol (Carrie Fisher), he decides to spend his time off lounging around the house, watching television and snooping on the goings on in the neighbourhood. His neighbours include Mark (Bruce Dern), who is still fighting the Vietnam war; Art (Rick Ducommun), who has too many conspiracies and not enough good sense; and the young Ricky (Corey Feldman), who seems to be in the movie just to attract the younger demographic and whose absentee parents are never quite explained. Ray is most intrigued by the reclusive new owners of the decrepit house immediately next to his. Loud noises and strange lights are emitted from their basement in the middle of the night. When they are spotted, the owners look like escapees from a 1920s lunatic asylum. And it doesn't help that they appear to be digging up their yard past midnight to either bury or retrieve dead bodies. Ray, Mark and Art start poking their nose deeper into the affairs of the house horrors. Director Jo Dante can do little with the Dana Olsen script that starts brightly but fades without warning. 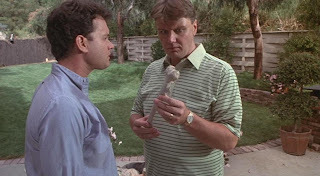 The opening 45 minutes of The 'Burbs is an entertaining introduction to the lives that live behind every hedge, exaggerated for effect but nevertheless recognizable enough from any real-world subdivision. Tom Hanks is effective as everyman, not quite aware of a creeping mid-life crisis, bored with life but content to burn his vacation by chilling out in his suburban haven. Bruce Dern is over-animated but quite funny as Mark, highly strung but coping with it thanks to the distracting charms of his wife Bonnie (Wendy Schaal). Rick Ducommun's Art is the annoying neighbour, with an answer for everything and knowledge of nothing. The back-end of The 'Burbs unfortunately throws away most of the good work and becomes a faux horror journey into the bowels of a creepy house, complete with hints of macabre medical experimentations, basement cremations, and human bones in the back yard. None of it is explained, as Olsen and Dante throw all logic out with the trash and surrender to juvenile instincts. As every suburbanite knows, manicuring the front lawn while abandoning the back yard to a pile of junk fools no one.